Herbs and their role for your disabled rabbit. Herbs are very healthy for rabbits and provide them with many natural benefits due to their healthy vitamin and nutrient makeup. Like with humans, they are also thought to provide remedies for some (minor) everyday rabbit ailments. When it comes to disabled rabbits, we need to be sure to provide them with a range of healthy plants for a variety of different vitamins and minerals to keep their bodies and immune systems as healthy as possible. As herbs rank among the top of healthy greens, it is great to add a type or two to your rabbit's daily veggie meal. Herbs are best fresh when available, but dried herbs may be used when an herb is out of season or if you would like a longer shelf life. A great option for dried herbs is to sprinkle some dried herbs on freshly washed vegetables (I do this with Romaine lettuce). The water will help to rehydrate the herbs and help them stick to the vegetables so that your rabbit can eat them. Use herbs on occasion in small amounts and be sure to introduce slowly to prevent any digestive upset. *Please note that herbs should not be used as a replacement for proper veterinary care. If you suspect that your rabbit may be ill, please contact your veterinarian. There are a number of different herbs to choose from, each with its own taste and texture. When we found out that there were so many herbs out there that we could use, all of which had great but different natural benefits for our disabled rabbit, we got a bit overwhelmed. We found ourselves at the store, stuck in front of vegetable and herb sections just wondering which to get. So, we thought we would share what we use most often in the hopes that it will help you choose. Easy to grow indoors and widely available in the summer, this is a great easy herb to add to our rabbits' diets. Our rabbits love the fragrant sweet smell and strong taste. Pinch off the leaves, rinse lightly and feed. It can handle storage in the refrigerator for a few days. Cilantro is easily accessible in stores year round and makes for the bulk of our rabbits' daily green diet. It is their favorite by far with it's citrusy smell and taste. They can eat the leaves and stems after a good rinse. Fresh is best as it does not handle storage very well. These greens are harder to find in stores, but are very healthy and a great add to our rabbits' diets. It has a peppery sort of smell and taste that they like, plus it helps keeps their digestion running smoothly. Just cut off the very bottom of the stems and give the greens a good rinse. They are hardy in storage. Fairly accessible and easy to grow, this pungent pickly herb is a good supplement that we add occasionally to our rabbits' diets. We find they are a bit pickier with this one, but it is easy to feed and holds up relatively well in the refrigerator for storage. 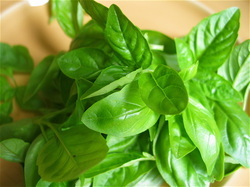 Mint is a staple herb at the grocery store and can also be fed dried sprinkled on some wet romaine lettuce. It has a beautiful minty smell and the rabbits love the taste. We use it for our disabled rabbit often to manage loose stool and any digestive tract blockage and she does great on it. Pinch off the leaves, rinse lightly and feed. Leave the leaves on the stem for better storage in the refrigerator. Both flat-leafed and curled parsley are easily accessible in stores year round and make for a good portion of our rabbits' daily green diet. We find that our rabbits like the flat-leafed better because the taste is somewhat stronger. 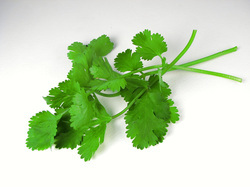 Overall, parsley has a "grassy" smell and taste that they enjoy. It seems to be a rich green that is very healthy for them. They can eat the leaves and stems after a good rinse. Fresh is best as it does not handle storage very well.